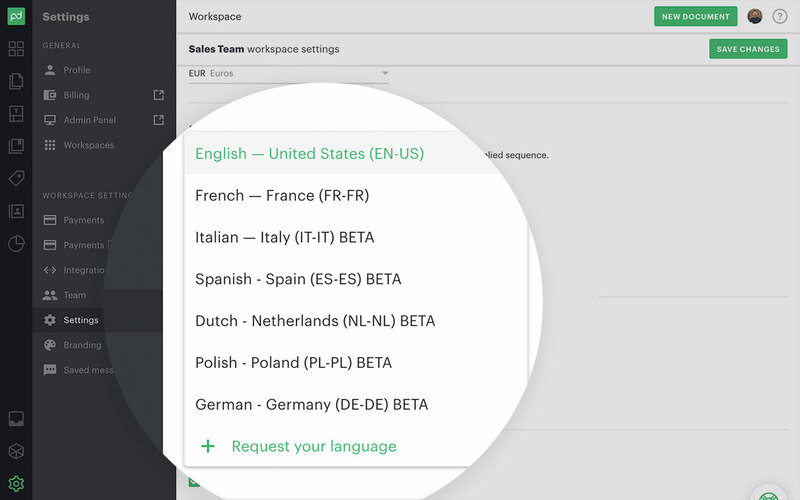 Allow your customers to navigate PandaDoc and get notifications in 7 different languages, including Polish, Dutch, German, and Spanish as well as French, Italian, and English. Make it easier for your customers to view and accept your proposals by presenting the doc in their native language. 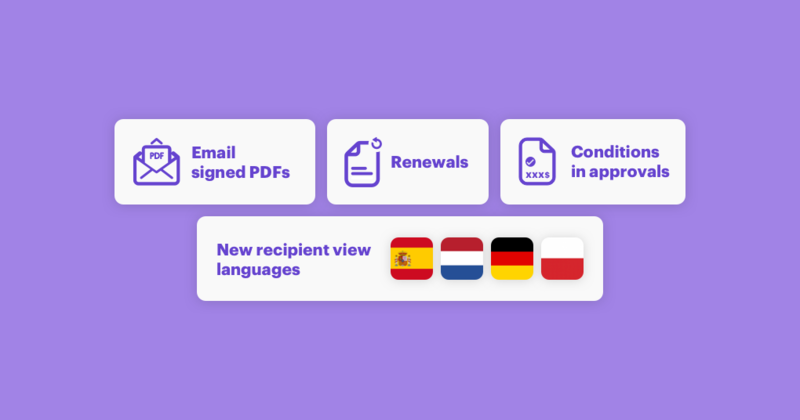 We’ve added 4 more languages for the recipient view: Polish, Dutch, German, and Spanish (in addition to French, Italian, and English). Adjusting the recipient view language will ensure that all PandaDoc automated emails and prompts for opening and signing a document are translated into the selected language. Set the recipient view language for specific documents, templates, or as the default for an entire workspace. For documents that are typically sent to recipients in a particular region, save time by setting up the recipient view language at the template level. For example, if you have a template written in Spanish or designed to meet Spanish legal requirements (e.g. 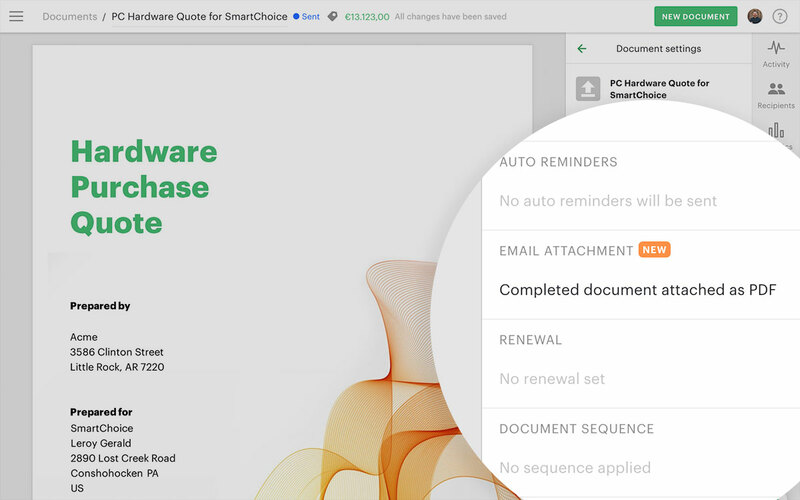 legal clauses or wording), set Spanish as the default recipient view language — all new documents generated from this template will be sent with emails and in-app prompts in Spanish. For regional teams with their own workspace, you can set the recipient view language as the default for the entire workspace. For example, a team working in the Netherlands can have their own templates with Dutch set as the default recipient view language. Recipient view language settings are available for all PandaDoc users. English is the default language with the option to change it to French, Italian, Spanish, Dutch, Polish, or German. Now you can send a PDF copy of any signed proposal or contract as an email attachment. Instead of manually downloading and organizing or emailing copies of the final document, we’ll send it to your recipients automatically, saving you extra time and hassle. You can also set up your account so that a PDF copy is automatically uploaded to your CRM or cloud storage app once the document is completed. For more info on how to use our Zapier integration or PandaDoc CRM integrations to store PDF copies of signed documents in the cloud or in your CRM, check out our FAQ. The new email attachments feature is included with all PandaDoc plans and can be enabled in your settings. Expedite your review process with PandaDoc approval workflows: you can automate your approval routine to help sales reps get their documents approved and out to customers as quickly as possible. Now approval workflows can include conditional logic to ensure that a contract or a quote gets to the right person for approval at the right time. You can add conditional rules based on the total proposal value (Grand Total) or a line item discount percentage. Reduce your risk on bigger deals by having managers involved in reviewing terms and pricing. Set up an approver or a list of approvers (including individuals or groups) for each value tier so that the smaller contracts have a simplified workflow and higher value agreements have a more rigorous review process. Have some “creative” sales folks? Avoid unapproved discounting by adding thresholds to the approval workflows. For example, if any of the items are discounted more than 15%, the document is automatically sent to the sales manager for approval. As always, you can track approvals using the Audit Trail and Document Analytics. Approvals with conditional logic are included on the Enterprise plan. Repeat customers are at the core of any healthy business. Since new business is often in the spotlight, it’s easy to lose track of renewals and ignore the critical function of retaining and expanding your current customer base. With our new renewal notifications, you’ll never have an upcoming renewal opportunity slip through the cracks again. All you have to do is set up a renewal date and adjust your notification settings to receive automated alerts when a contract is up for renewal. You can also see which documents are renewing soon right in your PandaDoc document list. For even faster renewals, use the “Transfer data to” feature to copy data like company or contact information and pricing details from the current contract into a new proposal or contract. The Renewals feature is included on the Enterprise plan. Try all these new features now by logging into your PandaDoc account. New to PandaDoc? Start a PandaDoc free 14-day trial to see how PandaDoc can help you close more deals.